Here we take a look at basic strategy, the tried, tested and proven blackjack strategy that delivers the best results and gives you the best chance of taking the casino to the cleaners. What is Blackjack Basic Strategy? How to Use Blackjack Basic Strategy? 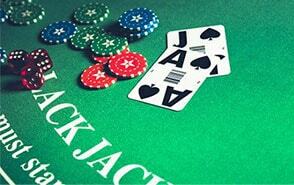 Blackjack is one of the most popular games to play in a casino, online or land-based casino floors. The main reason for that is that in the long term it is the casino game that gives you one of the best chances of winning. If you don’t know how to play blackjack you should check out our guide, which also contains the key points about basic strategy. However, if you know the essentials of blackjack and you simply want more info about the basic strategy, then keep on reading. Alternatively, why not play one of the best slots around, Rainbow Riches, or grand yourself a no deposit casino bonus and enjoy casino action totally for free, with no risk to your own money? In blackjack, it is possible to ascertain what is the most lucrative decision to make in any given situation according to the cards you have and those of the dealer. Whilst card counting is concerned with cards that have been played previously, the basic blackjack strategy remains one of the best possible ways to play the game of 21. The exact details of basic strategy, that is to say, which decision you should make, vary slightly according to the precise rules you are playing with. You can see a guide below for the most common rules of the game and the strategy that applies to them. You can view and print the Blackjack Basic Strategy Table (PDF version)that is shown below for details on how to play a standard game with 4 to 8 decks and the dealer standing on a soft 17. The basic strategy is 100% accepted as being valid and can be used at many land-based casinos. Thanks to some mathematical estimations the basic strategy can deliver amazing results in the long term and can keep the house edge – the casino’s advantage – down to the lowest possible level according to the rules of the blackjack variant you are playing. When players are simply relying on luck and their own instincts the house edge is estimated at 2.50%. However, if you use the basic strategy you can lower the house’s advantage to 0.50% which is a huge improvement in your chances of winning. Whenever you play online blackjack we strongly recommend you keep a copy of our basic strategy guide to hand. Alternatively, you can find one to suit the exact rules you are playing, since there are slight differences in splitting, doubling and so on. No matter what your instincts tell you, what you usually do or what you think is the best move, any deviation from basic strategy may cause you to lose more and win less in the long term. Of course, standing on 16 to a dealer’s eight may win you the odd hand here and there when the dealer busts but, more often than not, he is likely to draw 9, 10 or ace (or make 17 or more through a combination of cards) which will lead to the dealer beating you. There are some bricks and mortar casinos that will also provide players with basic strategy charts as a service. After all, the casino knows that even when a player plays “perfectly”, the house retains a bigger advantage. That said, by using the basic strategy you do not have to simply rely on luck to overcome the house edge. In addition to that, if you are wagering an online blackjack casino bonus you also give yourself the best odds of walking away with as much as possible of that bonus still intact. Players who use the basic strategy will have the opportunity to use a chart that will tell them what action to take depending on their hands and the cards of the dealer. According to the basic strategy, you should surrender when you are holding a hard 16 (except for a pair of 8s) when the dealer has 9, 10 or Ace. You are also advised to surrender a hard 15 when the card of the dealer is 10. When it comes to splitting, you should always split Aces and 8s and never split 5s and 10s. Split 2s and 3s if the dealer has 4, 5, 6 or 7. You should split a pair of 4s if the dealer is holding 5 or 6. If you see that the dealer is showing 2, 3, 4, 5 or 6, you should split your 6s. It is recommended you split 7s if the facing-up card of the dealer is between 2 and 7 and split a pair of 9s vs a dealer’s card 2, 3, 4, 5, 6, 8 or 9. If you are using the basic strategy, you should double hard 9 against a dealer’s card between 3 and 6. Double a hard 10, unless the dealer is holding 10 or Ace. If you are holding a hard 11, you should double down, except when the facing-up card of the dealer is Ace. Double soft 13 or 14 when you see that the dealer is holding 5 or 6. When your hand is soft 15 or 16, you should double against a dealer’s hand between 4 and 6. If you are holding a soft 17 or 18, you are advised to double when the dealer holds between 3 and 6. When it comes to hitting or standing, the strategy advises to always hit a hard 11 or less and hit a hard 12, except when the dealer is holding 4, 5 or 6. You should stand on hard 13, 14, 15 or 16 when the dealer holds between 2 and 6. Otherwise, you should hit. Always stand on hard 17 or more and always hit soft 17 or less. You should stand on soft 18, except for the cases when the dealer has 9, 10 or Ace. In that case, you are advised to hit. When you are holding a soft 19 or more, you should always stand. 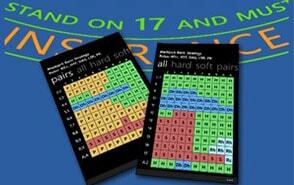 If you are playing a blackjack variant where the dealer hits soft 17, there are several moves you are advised to make. You should surrender 15, a pair of 8s or 17 if the dealer holds Ace. You should double 11 if you see that the dealer has Ace. Double soft 18 if the card of the dealer is 2 and if he/she has 6, you should double when you are holding soft 19. 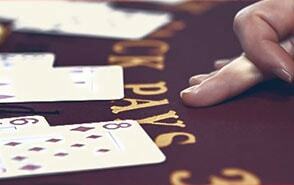 Whenever you play blackjack you have several options for a move which will determine the outcome of the game. If you’re playing blackjack online then it’s easy to consult your basic strategy chart. You are not advised to take insurance when you are playing blackjack as it will most often cost you losing your money. The idea behind taking insurance is that when the dealer is holding Ace, players can make a bet which is the same size as their initial wager. This way, if the dealer happens to have a 10, you will lose your initial bet but you will win the double of your insurance. This would mean that even if the dealer gets a blackjack, you will break even. If this is not the case, you will lose your insurance bet and your initial wager will play out as it usually would. Although this type of bet sounds great, it is proven that it actually causes players to lose a significant amount of money. If you take insurance, you are bound to be paid if the second card of the dealer is 10, Jack, Queen or King. This would mean that there are four chances to receive money for your insurance bet when the dealer holds Ace. However, when you think about it, there are nine other possibilities for the second card of the dealer. This would mean that you have a bigger chance to lose your bet rather than getting paid for it. What is more, the insurance pays only two to one which is certainly not a lucrative payout. This is why players are not advised to use insurance while playing blackjack. Try to memorize some moves of the basic strategy. Even though many land-based casinos will allow players to use charts, it is still rather awkward to have the entire table waiting for you to check your chart for every single hand that is being played. You do not have to worry as you will most certainly learn how to act when some common hands are dealt in the game. A tip that you may use to make the process of memorizing easier is to put similar hands in one group. You can take as an example all the hard hands that total 4, 5, 6, 7 or 8 are played the same way as you always hit. If you happen to play a blackjack version that does not allow doubling down, you can add hard 9, 10 and 11 to this group. However, you should avoid such blackjack variants as their house edge is higher and you have a smaller chance to win. You can start with all hard hands as they are followed by pretty similar actions and are easy to memorize. You can then move on the soft hands as they are also played almost the same way and the only difference comes with knowing when you should double down. The last part will be memorizing the splits for 2s, 3s, 4s, 6s, 7s and 9s. Do not worry if you still do not remember the moves for a certain situation as you can always consult your chart. When you are playing blackjack using basic strategy, you reduce the house edge to 0.50% which gives you the great opportunity to revel in wonderful payouts. You can easily find charts for different popular blackjack variants online and follow the basic strategy that will guide you to a winning outcome. What is more, many brick-and-mortar casinos also offer players the chance to use charts while playing the game of 21. Thanks to the basic strategy even rookie players can easily become experts and rack up impressive wins.